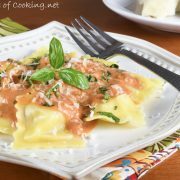 My husband and I went out for a lunch date earlier in the week and I had homemade pork ravioli with a delicious tomato cream sauce. My husband and I both thought the dish was incredible and I wanted to recreate that sauce soon. I cooked all day today and this sauce was one of the recipes I made. It simmered for 45 minutes and I served it over cheese ravioli with lots of fresh basil and grated parmesan. The sauce was a huge hit with all of us, especially my husband who had seconds and was very excited to get the leftovers for lunch tomorrow. Melt the butter and olive oil over medium heat in a large skillet. Add the onion and crushed red pepper flakes and cook, stirring often, for 3-4 minutes. Add the minced garlic and cook, stirring constantly, for 1 minute. Add the two cans of tomato sauce and a pinch of sugar then stir to combine. Bring to a simmer and reduce heat to low and cook, stirring occasionally, for 45 minutes. Add the cream and mix well. Taste then season with sea salt and freshly cracked pepper, to taste. Serve over desired pasta al dente and top with lots of fresh basil and grated Parmesan cheese. Enjoy. Melt the butter and olive oil over medium heat in a large skillet. Add the onion and crushed red pepper flakes and cook, stirring often, for 3-4 minutes. Add the two cans of tomato sauce and a pinch of sugar then stir to combine. Bring to a simmer and reduce heat to low and cook, stirring occasionally, for 45 minutes. Add the cream and mix well. Taste then season with sea salt and freshly cracked pepper, to taste. Serve over desired pasta al dente and top with lots of fresh basil and grated Parmesan cheese. Enjoy. A very satisfying and delicious meal! Looks delicious Pam – pretty presentation – and sounds similar to our soup recipe (we use no chicken stock). One of my favorite sauces and so pretty for the holidays. 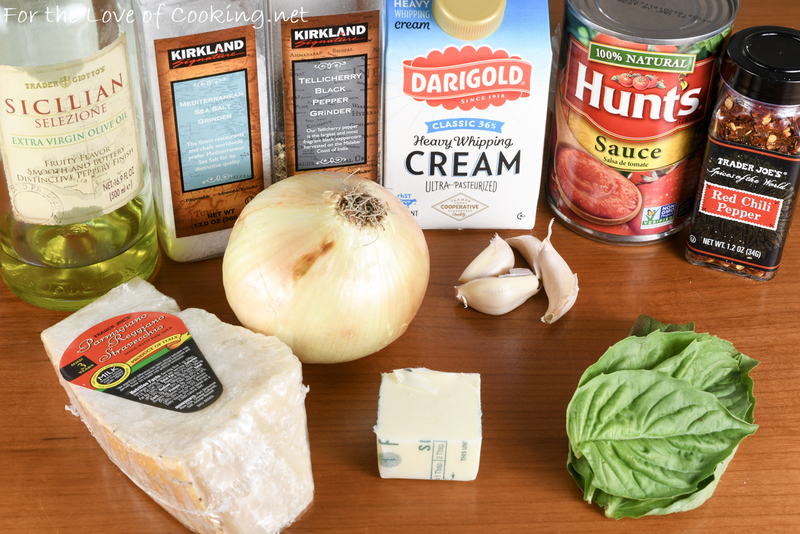 Your recipe looks so delicious and perfect for ravioli. 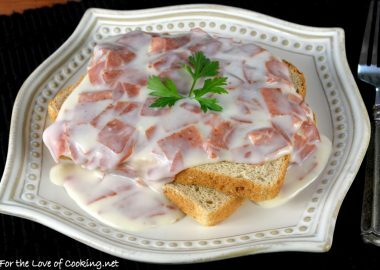 I’ve been making a sauce like this ever since we had it at a local restaurant here. 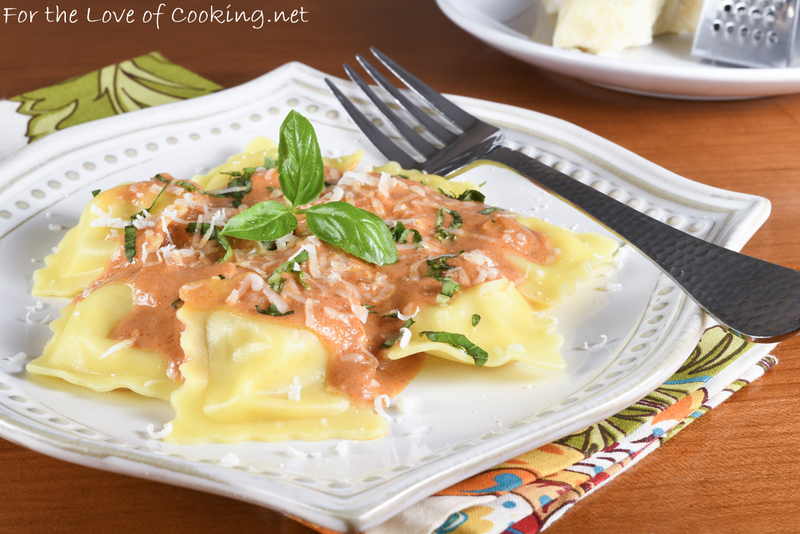 Around here, they call it “Vodka Sauce,” although I’m not sure why. It is really great; try it with chicken and pasta some time. i can’t say that i’ve ever added cream to my marinara sauce, but it obviously enhances its texture, color, and flavor! bravo! 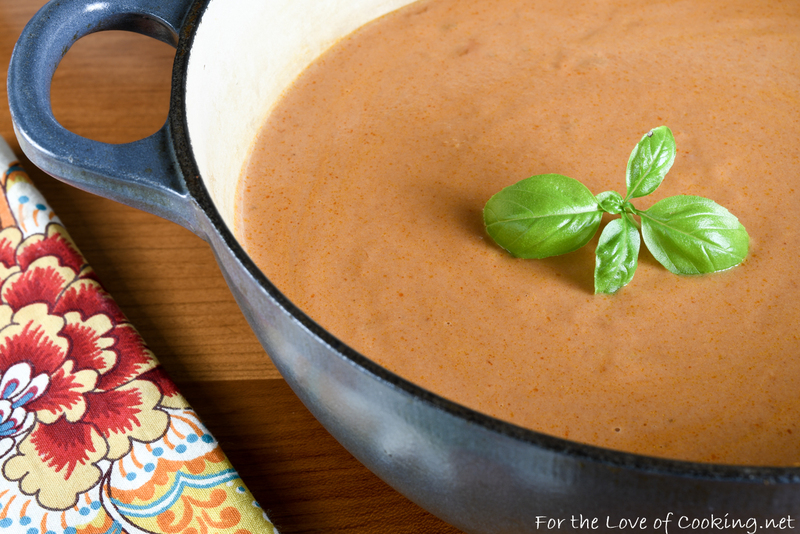 Now I really want something with tomato cream sauce for lunch or dinner today! Yum.